Prof. Lee earned her master’s degree at KAIST, and her doctorate degree at Stanford University. She has published over 100 papers in renowned journals on proteomics, cancer metastasis and stress response signaling mechanism. She has also worked for five years as an editorial board member of ‘Molecular & Cellular Proteomics (MCP),’ an academic journal on Proteomics published by the American Society for Biochemistry and Molecular Biology. 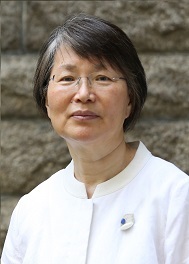 Prof. Lee served as the President of the Association of Korean Woman Scientists and Engineers (KWSE) from 2006 to 2007, as a member of the National Science & Technology Commission in 2007, and as Dean of the Graduate School of Ewha Womans University in 2010. Prof. Lee served as President of INWES from 2011 to 2017.